In November 1912, after decades of hard work and many setbacks, Oregon women finally achieved the right to vote through the removal of the word “male”, in reference to voting, from Oregon’s constitution. 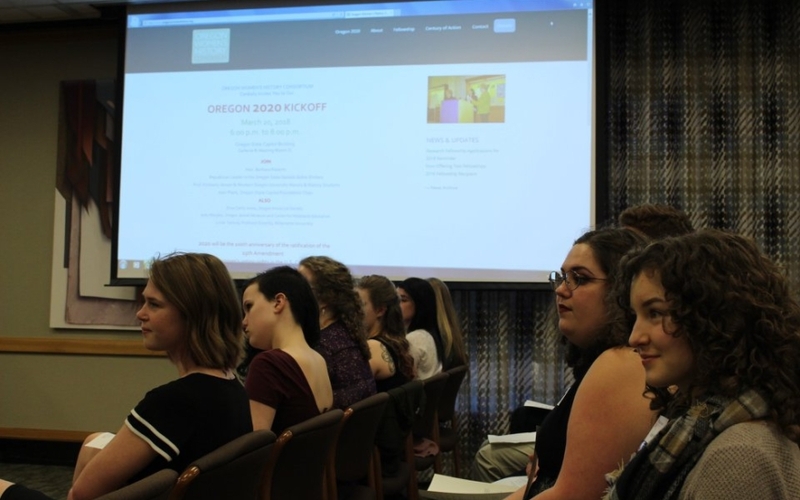 With the right to vote came the right to hold elective office, something Oregon women were eager to step into, specifically in the realm of school boards. 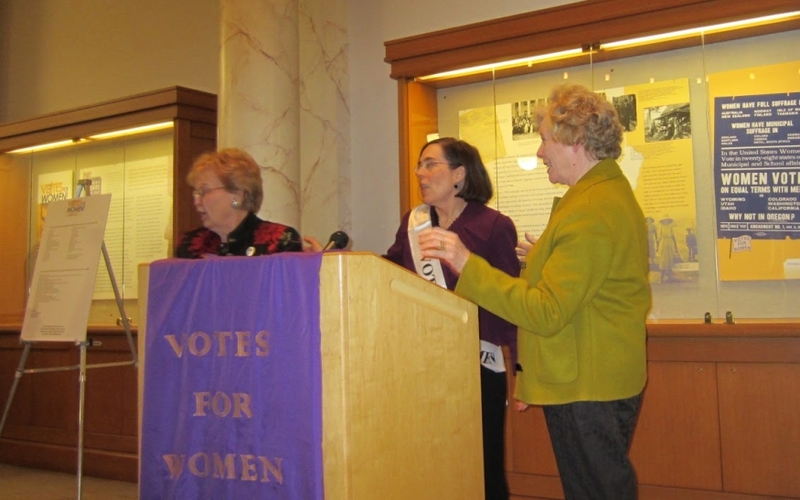 As Kimberly Jensen noted in “Woman Suffrage in Oregon,” some Oregon women had been able to vote in school board elections for years, based on property and marital status. However, many women were still excluded from this right. 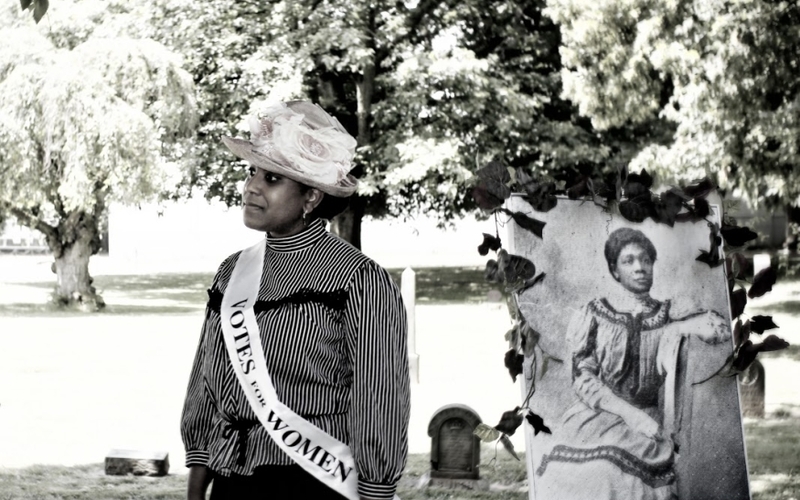 The 1912 voting rights victory opened the doors for women who didn’t meet the property and marriage criteria to finally make a political difference. 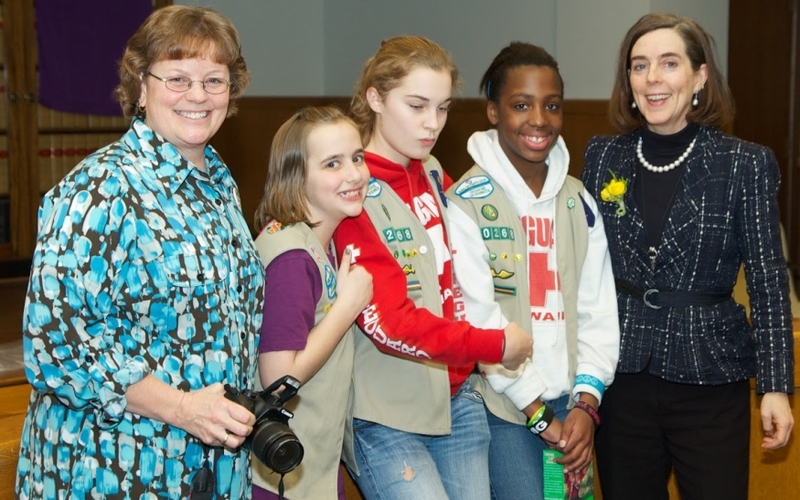 As soon as women in Oregon were able to vote and be elected to school board, the names of qualified women flooded the ballots as candidates for office, and Oregon saw many of them victorious in their campaigns. Society had long claimed children as within the spectrum of women’s responsibility. For women who desired to make a political difference, this framework allowed school boards to be an obvious first step in political activism. School boards, which had a direct connection to the upbringing of the child, had been left in the hands of men, who seemingly had little to do with the world of children. This served as the main source of logic behind why women should be able to bring their expertise of the needs of children to the school boards. Support for women on school boards sprung up everywhere. As Karen J. Blair highlights in her article “Normal Schools of the Pacific Northwest: The Lifelong Impact of Extracurricular Club Activities on Women Students at Teacher-Training Institutions, 1890 – 1917,” organizations such as the Washington State Federation of Women’s Clubs “successfully lobbied … for two women on the school board of every large city in the state.” (14) Though their participation in politics wasn’t popular everywhere, women successfully broke into the political world of office holding through claiming their spots on school boards across the nation. “Elect a Woman to the School Board,” Medford Mail Tribune, June 7, 1912, 4. 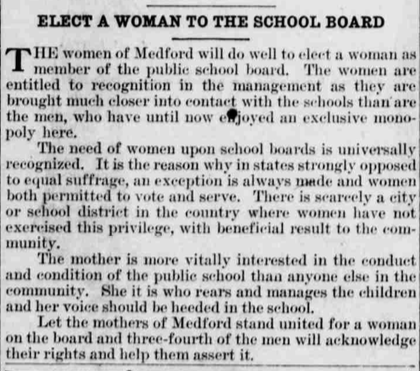 The desire to see women claim spots on the school board was considered “universally recognized” in an editorial found in the Medford Mail Tribune from June 7, 1912. The editors believed women were “more vitally interested in the conduct and condition of the public school than anyone else in the community,” based on their interest in the upbringing of their children. Thus, their election to school boards was logical and considered acceptable even in more conservative areas. This goal of bringing women into the world of school politics manifested itself in sort of “help wanted” advertisements (like this one) in newspapers across the state. Groups interested in promoting the equal voices of women searched for women, and often mothers, willing to be candidates. Blair notes that many of these groups found success in electing women to school board positions. “Cove Women Defeated,” Morning Oregonian, June 23, 1921, 6. Change doesn’t always come easily, however, and this was definitely shown to be the case throughout the fight for woman suffrage. 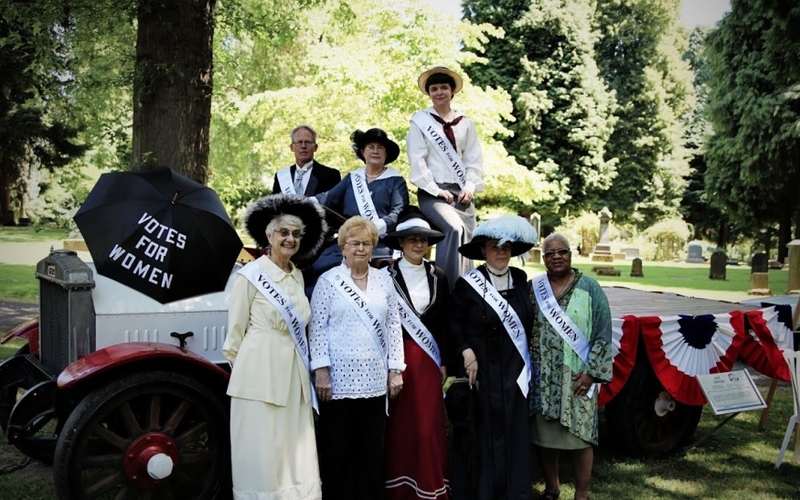 Some cities, such as Cove, Oregon, proved resistant to the election of women to their school boards, even until 1921 – nine years after the 1912 victory of suffrage in Oregon. As shown in an article from the June 23, 1921 edition of the Morning Oregonian, women were often defeated in school board elections. An “equally competent, popular woman” was defeated by A. 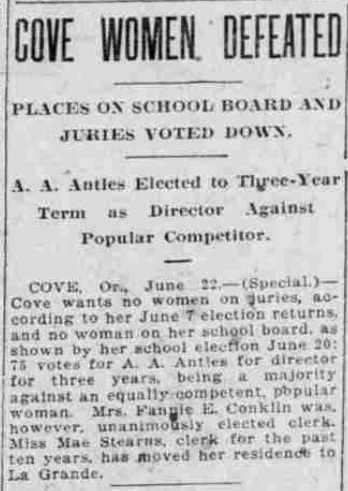 A. Antles for director of the school board in Cove, Oregon because, “Cove wants … no women on her school board.” The disheartening defeat of women in elections for school boards did not serve, however, as an end in the fight for equality. It instead created a drive in women to continue fighting for change. “Lebanon Woman Qualified for School Board Directorship,” Sunday Oregonian, June 22, 1913, 9. Women had long been considered less qualified than men in the political arena. Regardless of their level of education or experience, they were often not seen to be competent. While this meant that they had to work hard to change the minds of the public, they were up for the challenge. Qualified and educated women such as Frances [Mrs. Byron] Millsap*, persisted and were victorious in their school board elections. Millsap, who graduated from Stanford and was president of the parent-teachers’ circle, was highlighted in the June 22, 1913 edition of the Sunday Oregonian as winning the position of director for the Lebanon, Oregon school board. 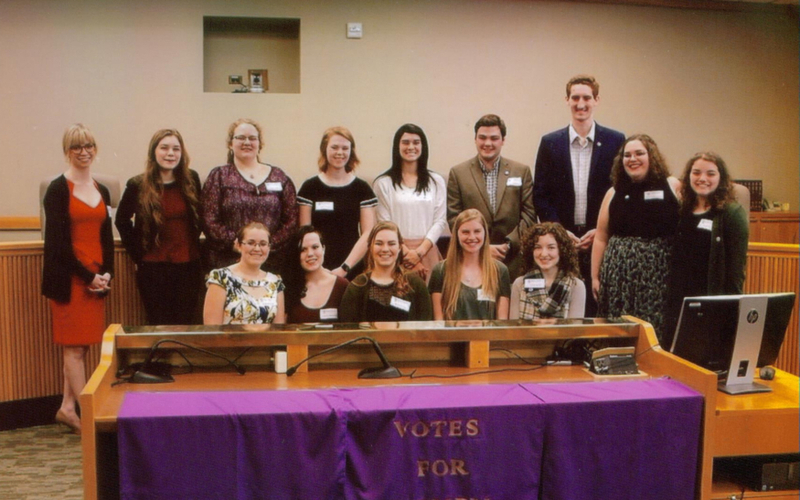 The article pictures Millsap and describes her as “in every way qualified for the position.” Through their election to school boards, women were able to showcase their talents and education to better the education of the children they served. “Mrs. Kerr Returns,” Morning Oregonian, February, 11, 1913, 14. The idea of women serving on school boards was especially attractive to female teachers. Shortly after the passage of Oregon woman suffrage in November 1912, many teachers supported the campaign of Mabel [Mrs. James B.] Kerr, of the famous Kerr family of the canning business. The editors of the Morning Oregonian for February 11, 1913 believed Kerr’s election to the school board of Portland, Oregon was “a great help to the women teachers.” Kerr remarked that “‘women can see things differently from men – maybe not better – but, well, the different viewpoints will be good for all parties.’” Female teachers felt that a woman on the school board would be able to serve as a good advocate for the things that were important to them, as well as remaining “sane and unbiased.” After so many years of the overwhelmingly female world of teaching being represented by men on the school board, it was refreshing to have a more like-minded representative to take on of the politics of this field. 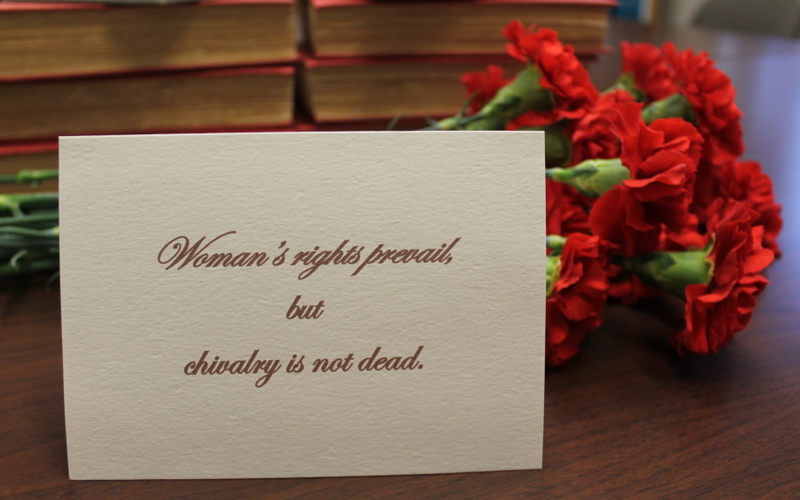 Women have faced uphill battles for much of history when looking at the fight for equality. As John D’Emilio and Estelle B. Freedman’s Intimate Matters points out, this did not stop them, however, from creating “new opportunities for women in the world of work. Whether as faculty at women’s colleges, residents of settlement houses, social workers, businesswomen, or journalists, they continued to make a place for themselves outside the home, beyond the boundaries of nineteenth century domesticity” (190). When the door was finally opened (through a lot of persistent, hard work) for women to serve on school boards, they wasted no time in proving that they were capable of finding victory in their elections and of serving schools well. *Census information indicates that Frances Millsap was the wife of Byron, not Bryan Millsap. The Oregonian evidently misspelled his name in this article. “Mrs. Kerr Returns,” Morning Oregonian, February 11, 1913, 14. Blair, Karen J. 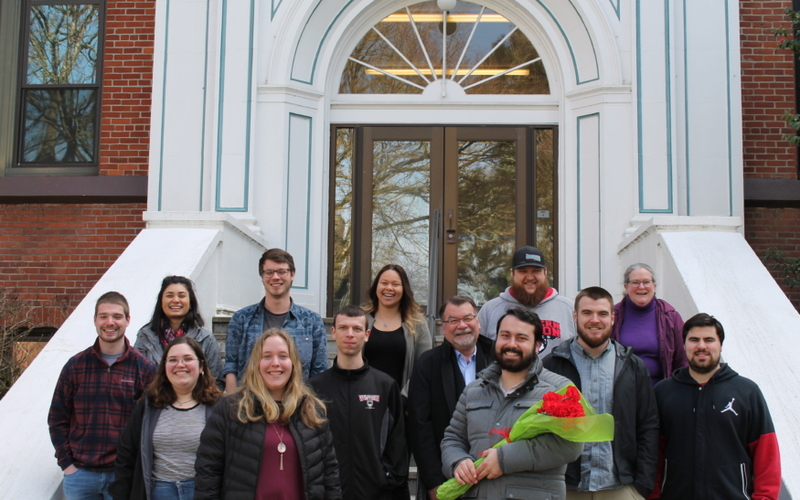 “Normal Schools of the Pacific Northwest: The Lifelong Impact of Extracurricular Club Activities on Women Students at Teacher-Training Institutions, 1890-1917.” Pacific Northwest Quarterly, 101, No. 1 (Winter 2009/2010): 3-16. 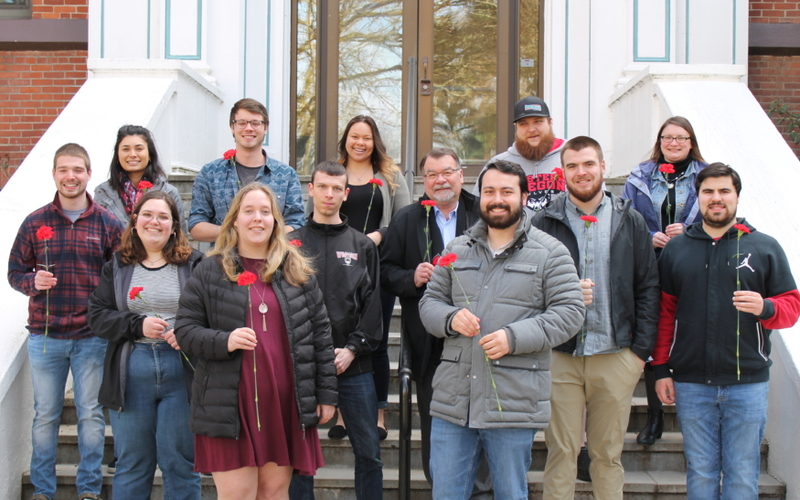 Sierra Fresh is currently a second-year student at Western Oregon University. Sierra is studying Elementary Education and Spanish with goals of becoming a teacher, and after that, would like to run for school board.